I'd like to know how to build a bare bones asynchronous DRAM controller. I have some 30-pin 1MB SIMM 70ns DRAM (1Mx9 with parity) modules that I'd like to use in a homebrew retro computer project. Unfortunately there's no datasheet for them so I've been going from the Siemens HYM 91000S-70 and "Understanding DRAM Operation" by IBM. Refresh seems pretty straight-forward with several ways to get it right. I should be able to do distributed (interleaved) RAS-only refreshing (ROR) during CPU clock LOW (where no memory access is done in this particular chip) using any old counter for the row address tracking. I believe all rows need to be refreshed at least every 64ms according to JEDEC (512 per 8ms according to the Seimens datasheetm i.e. standard refresh of cycle/15.6us), so this should work fine and if I get stuck, I'll just post another question. I'm more interested in getting read and write simple, correct and determining what I should expect as far as speed. I'll first quickly describe how I think it works and the potential solutions I've come up with so far. Basically, you split a 20-bit address in half, using one half for the column and the other for the row. You strobe the row address, then the column address, if /W is HIGH when /CAS goes LOW then it's a read, otherwise it's a write. If it's a write, the data needs to already be on the data bus by that point. After a period of time, if it's a read then the data is available or if it's a write, the data is sure to have been written. Then /RAS and /CAS need to be brought HIGH again in the counter-intuitively named "precharge" period. This completes the cycle. t(CAC) - t(CAH) = ? The times I'm referring to are in the following diagram. Even if it's not exactly that, it's something like that and I think the same kind of solution will work. So I've come up with a couple of ideas so far but I think only the last has potential and I'm looking for better ideas. I'm ignoring refreshing, Fast Page and Parity Checking/Generating here. The simplest solution is just to use a counter and a ROM where the counter output is the ROM address input and each byte has the appropriate state output for the time period that the address corresponds to. This won't work because ROMs are slow. Even a pre-loaded SRAM seems like it would be far too slow to be worth it. The second idea was to use a GAL16V8 or something but I don't think I understand them well enough, programmers are very expensive and the programming software is closed source & Windows-only as far as I know. My last idea is the only one I think might actually work. The 74ACT logic family has low propagation delays and accepts high clock frequencies. I'm thinking read and write could be done with some CD74ACT164E shift register and SN74ACT573N. Basically, each unique state gets its own latch statically programmed using 5V and GND rails. Each shift register output goes to one latch's /OE pin. If I understand the data sheets right, the delay between each state could only be 1/SCLK but that's much better than a PROM or 74HC solution. So, is the last approach likely to work? Is there a faster, smaller or generally better way to do this? I think I saw that the IBM PC/XT used 7400 chips for something related to DRAM but I only saw top-board photos, so I'm not sure how that worked. p.s. I'd like this to be doable in DIP and not "cheat" using an FPGA or modern uC. p.p.s Maybe using gate delay directly with the same latch approach is a better idea. I realize both shift register and direct gate/propagation delay methods will vary with temperature but I accept this. For anyone that finds this in the future, this discussion between Bil Herd and André Fachat covers several of the designs mentioned in this thread and discusses other problems including DRAM testing. There are complete schematics for the IBM PC/XT in the IBM Personal Computer XT technical reference manual (Appendix D), which you may be able to find on line. The problem here is that, given a strobe line which is activated upon a memory read or write, you wish to generate RAS, CAS and a control line (call it MUX) for the address multiplexer. For simplicity, I will assume unrealistically that the strobe, RAS, and CAS are all active-high. Use the strobe for RAS. Use a delay line (a part whose output is a time-delayed version of its input) on RAS to generate MUX, and use another delay line to generate a still later version of RAS, which is used for CAS. This strategy is used by the PC/XT and the TRS-80 Model II. An example (modern) delay line part is the Maxim DS1100. Use the strobe for RAS and delay it for MUX and CAS, but do this using a high-speed shift register instead of a delay line. This strategy is used by the TRS-80 Model I and the Apple II. Use custom ICs. This is the strategy of the Commodore 64. Your question is complicated enough that I'm not even sure what your actual problem is, but I'll try! The "cleanest" 6502-based DRAM design I could find is from the Commodore PET 2001-N. It has a 6502 running at 1 MHz, but the DRAM logic is clocked at 16 MHz, likely to generate all the timings. I have not analyzed the details, but the main action seems to happen with a 74191 4-bit counter connected to a 74164 shift register. This outputs 8 separate lines going into a 74157 MUX which is controlled by the R/W line. The output from the MUX goes into a 7474 flip-flop and some discrete logic to generate the final RAS/CAS signals. 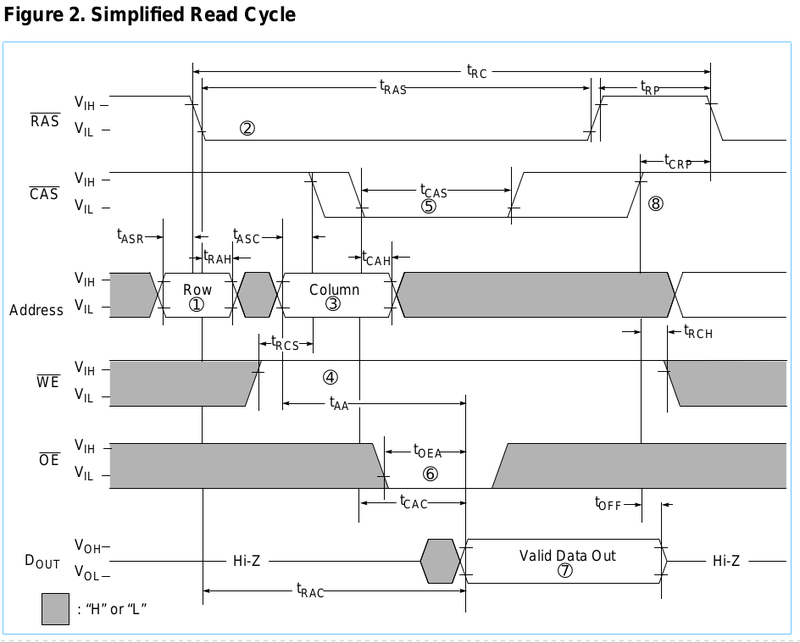 Here is an excerpt which links to the relevant page in the reference schematic. Refresh is handled with a separate counter, and each address line is hooked up to a multiplexer that selects either the "real" address or the refresh address. Parts of this logic also seems to generate timings for the video subsystem. I'm sure it can be simplified for your particular needs, but I think that something similar can be useful: A high frequency counter, shift register and multiplexers. While I completely understand the spirit of your project and your desire to use non-fancy parts, I would definitely go the FPGA way if I were you. It can be much easier to debug issues or make statistics of the memory operations that your CPU issued. You can use logic analyzers on parallel buses, but it's never fun (a friend of mine does something along these lines - he wants to write a cycle-exact simulation of 8088 and for that reason he needs to collect those statistics about memory accesses and timing patterns. He uses the original chip set (8288, 8280, 8237) and uses a logic analyzer with a lot of channels, but from his experience I can tell you it is a drag). Not the answer you're looking for? Browse other questions tagged memory timing dram 7400 or ask your own question. How DRAM refresh cycles work? How many bits are addressed through one CAS command in DRAM?